Vibrava in game: 570 Who? Important notice! Pokemon Vibrava is a fictional character of humans. 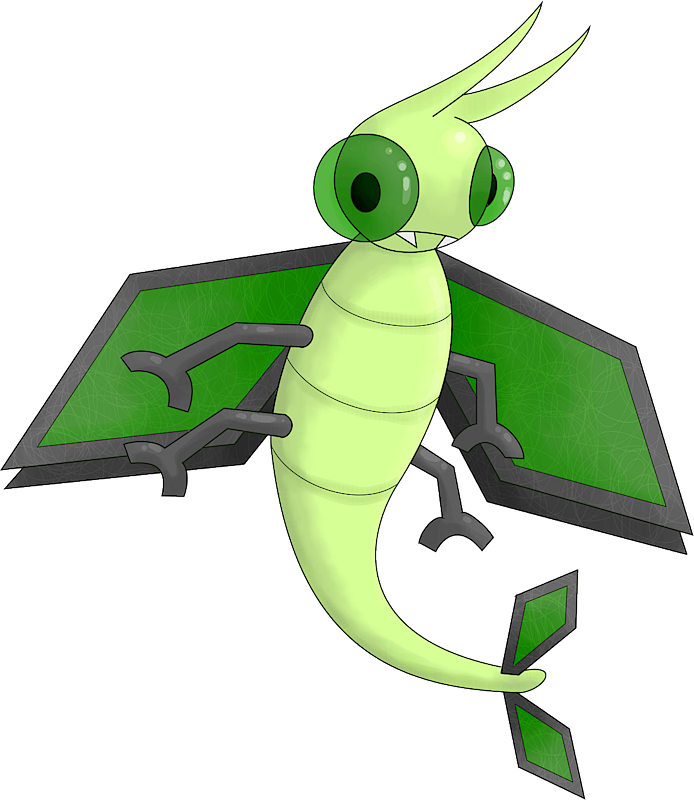 Vibrava is a dragonfly-like Pokémon. 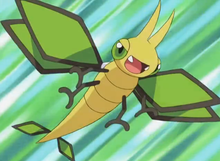 It has a small head with two yellow antennae and green bulging eyes with black oval-shaped pupils. Its mouth has two large white teeth protruding from each side. 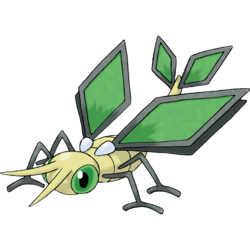 It has a skinny yellow body, four skinny black legs with slender feet, and four green, rhombus-shaped wings with black edges. There are similarly-colored rhombus shapes at the end of its tail. Vibrava's wings are not fully developed, so it is unable to fly very far. However, it is able to compose vibrations and ultrasonic waves with its wings. Humans get headaches from these waves. After causing prey to faint, it uses acid to melt the prey. Vibrava lives on rough terrains. Vibrava's first anime appearance was in Beg, Burrow and Steal. Dozens of Trapinch were seen evolving into them at an underground lake. Team Rocket made a failed attempt to steal the Vibration Pokémon despite the fact the idea Meowth had of using their previous forms as nut-crackers was now foiled. The Vibrava helped Ash, May, Max, Brock, Hal and Elisa out of the underground labyrinth. A Coordinator named Brianna used a Vibrava in the Battle Stage of the Chrysanthemum Contest in Spontaneous Combusken. Vibrava first appeared in the first Advanced Generation series movie, Jirachi: Wish Maker, in the form of a swarm. A Vibrava appeared in Hi Ho Silver Wind! under the ownership of a Coordinator participating in the Hoenn Grand Festival. A Vibrava appeared in Pokémon Ranger and the Kidnapped Riolu! Part One. A Vibrava appeared in A Relay in the Sky!. AG106 Vibrava Ash's Pokédex Vibrava, the Vibration Pokémon. Vibrava is the evolved form of Trapinch. By flapping their wings, they compose vibrations, emitting ultrasonic waves. Hugh owns a Vibrava, which evolved from his Trapinch. It vibrates its wings vigorously, composing ultrasonic waves that cause serious headaches. Trapinch's Attack stat goes down when it evolves into Vibrava, but returns to the original stat when it evolves into Flygon.